MACSUR CropM now serves as the European hub for Coordinated Global and Regional Assessments (CGRA) of Climate Change Impacts. ⇒ "global" menu. The activities of the MACSUR knowledge hub members, known as MACSURians, have created great momentum in the modelling of agricultural production: crops, livestock, socioeconomy. By the end of the funded project phase in 2017, many scientific achievements, input to politics and practice and a large network has been produced. MACSURians are taking on the next challenges in improving the modelling agriculture with climate change in new projects. They stay connected through the knowledge hub. The Knowledge Hub FACCE MACSUR brings together the excellence of research in modelling grasslands, livestock, crops, farms, and agricultural trade in order to improve the modelling of climate change impacts on European agriculture and in order to illustrate to political decision makers how climate will affect regional farming systems and food production in Europe. To achieve this goal, MACSUR engaged in a range of activities, including methodological comparisons of models and use of their outputs (scaling, uncertainty), linking of complementary models from different sectors, involvement of stakeholders, training of young scientists, and establishing a community of practice across a broad range of scientific disciplines. The five-year project started in June 2012. FACCE MACSUR is organized as a Knowledge Hub, a new financial and organizational instrument. The novelty of MACSUR lies in the in-kind contributions of 2 million euros which, in addition to the 6 million euros of new money, contribute to facilitating the convergence of already funded and ongoing research, as well as funding new research [financial figures refer to the period 1 June 2012 - 31 May 2015 and were established on preliminary accounting data]. The project includes currently 70 institutions from 18 countries. Activities are funded by national agencies, with the amount of funds and the regulation of their use governed at the national level. General information on the FACCE MACSUR Knowledge Hub. Creating a forum for knowledge exchange across science disciplines. Adoption of good-practice examples from other scientific communities. Structured description of models and comparisons of model performance. Selection of regional case studies as showcases of integrated and inter-disciplinary modelling work. Development of European Representative Agricultural Pathways as input to global scenario exercises. Development of a data classification and rating tool for exploration of existing data sets. Advancement of knowledge in modelling of crop production, grassland production, price development. Collaboration on new funded projects. More than hundred papers on methodological aspects of modelling food security published in peer-reviewed journals. Overview papers in high-profile journals. Major international scientific conferences and workshops. MACSUR made significant progress in the linking of models and scientific communities across individual disciplines for contributions to regional and European assessments. As a result of MACSUR activities models could be compared and then improved, crop rotations have been included in modelling, and methods have been refined for upscaling model results. Evaluating and comparing models for assessments at farm-scale and including livestock has been a major step forward for providing the basis for regional and European-scale assessments. At the aggregated European level, adaptation and mitigation, economy and environment, policy and consumer interests meet, so that modelling becomes very complex. Several important conclusions emerged: Improving animal health and welfare are important adaptation and mitigation strategies; crop, livestock, farm and socio-economic models should be able to respond to adaptation measures and provide links to climate and land use change; linking models across scales, interaction with stakeholders, and cross-sectoral learning are vital for supporting decisions at policy level. With improved modelling of crops and livestock, socio-economic models developed and applied in MACSUR, the Knowledge Hub now provides the links to global and regional economies and links to the internationally agreed shared socioeconomic pathway (SSP) scenarios. The key message from the assessments is that future legislative frameworks for mitigation, adaptation and resource management as well as consumer behaviour are crucial for how well regional and European agriculture can deal with climate change. Research in MACSUR has been documented in more than 200 peer-reviewed publications including significant strategy papers, several special issues of journals, numerous presentations, and a great number of interactions with policymakers and stakeholders along the agro-food chain. The purpose of regional case studies is a simultaneous and interlinked development of a common conceptual framework and actual models and model links to assist policy makers and actors in the agri-food chain in identifying effective and efficient adaptation and mitigation measures and potential consequence scenarios, e.g. impact on food yield, quality, nutritive value, disease load etc. in perceived hotspots of climate impacts. The studies are geared to ansower the question "what would be the different contributions of different European adaptation strategies to global food security until 2050 at different scales (farm to EU) while keeping the GHG targets?" 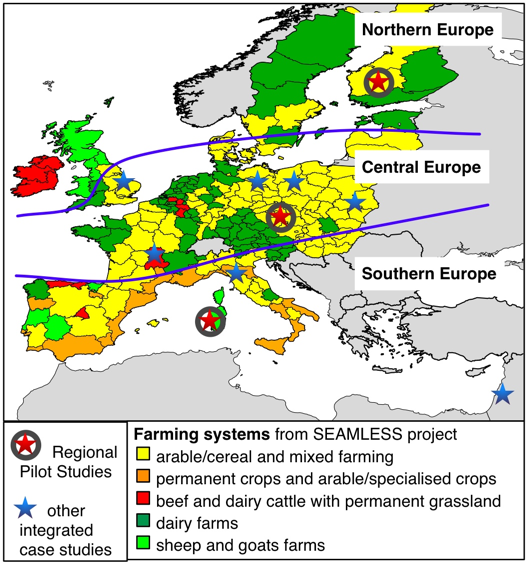 Three case studies in Northern Savo (Finland), Mostviertel (Austria), and Oristano (Sardinia, Italy) have been selected as showcase pilot studies to represent the farming systems in northern, central and southern Europe. The case studies expand existing case studies. For compatibility with international research networks AgMIP and ISIMIP the Regional Pilot Studies will apply the new Shared Socioeconomic Pathways (especially SSP2 "continuation" but also SSP3 "fragmentation") in conjunction with the Representative CO2 Concentration Pathway of 8.5 W/m2 (most similar to the SRES A2 emission scenario of the IPCC reports). What do people in the street think about climate change?